The Gauley is a Take-No-Prisoners river, one of the best runs in the country!! There are over 100 rapids with 50 of them BIG-TIME! Roaring through canyon walls that exeed 1000 feet, the Upper Gauley is an exciting challenge for all levels of river runners. 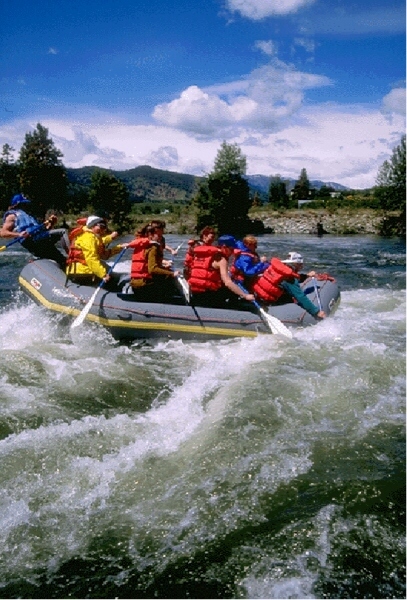 The upper level of the Gauley is ranked seventh in the world for its technical and demanding rapids that are only preceeded by its reputation. We're talking big boat-bending water that makes the ride so exciting you'll find yourself hooked before rapid number 3. As we rocket through the upper section of this breathtaking canyon there are five Class V rapids which will warm you up in short order! The rest of the upper level remembers that we're not God and let's us pass safely, even allowing you to swim through a couple of Class III rapids. With names like 'Postage Stamp Rock', 'Six Pack Hole', 'Guide's Revenge' and 'Sweets Falls' there's a new challenge around every bend. Rafters wishing to run the Gauley should have some small boat experience, like conoeing, and knowing how to swim is a must. During peek flows the better outfitters use smaller paddle crafts, six people and a guide, for maximum excitment. This river is only runnable when the Army Corp of Engineers release the Summersville Damn the weekend after Labor Day. With an expected flow of 3500 cf/s of water this river will instantly accellerate you to 20 knots at the base of the damn where we put-in. There are no portages on this river and a halfway picnic extravaganza is provided with your trip. During the course of this trip we will drop 38 feet per mile, dropping us almost five hundred feet by the time we reach the 'Class V' drive out of the canyon!!! Take in some of Sarah and Jason's pictures!